Take a day to recharge your batteries, to go it alone on your own two feet for a while, to reconnect with the Real World. Take an epic (for a low-lander) hike into the Sierra Nevada Mountains - the Hoover Wilderness and the backside of Yosemite National Park. Pick a perfect August day when the weather is almost like it is in late September: cool, slight breeze, no thunderstorms. Start at the Green Creek trailhead at 7800'. Plunge into the Jeffrey and aspen forest. Hug a Jeffrey tree, smell the vanilla bark. Don't bother hugging an aspen - the aspen aren't interested. Hug the infrequent, splendid grandfather Western Juniper tree, feel the soft bark against your ear. As you climb, the Jeffreys will give way to the lodgepole pines, sharing space with white fir and red fir and the great Western Hemlocks. Hug a lodgepole, scare an indignant mountain chickadee out of the branches. "Chick-a-dee dee dee DEE!" Skirt Green Lake, continue climbing to where the lodgepole forest bows to the Western White pine. They are short, scrubby; the soil is thin and this is where the wind howls in the winter and snow can be measured in dozens of feet. Some of the pines are permanently bowed from the wind and snows. 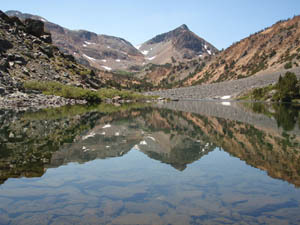 Hike below rugged sentinel peaks reaching to 9 and 10,000', guarding alpine lakes that are the sharp blue color of the Mediterranean: East Lake, Nutter Lake, Gilman Lake, each one higher than the next. 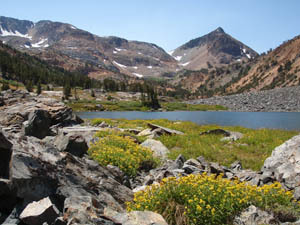 Pass under Epidote Peak, whose snow patches still cling to its sides and drain into the twin Hoover Lakes. Stop to touch the lakes - cold. Inviting. Watch little fish leap in the air because you didn't bring a fishing pole. Smell the flowers blooming by the lake. Continue a steady ascent, walking over rock steps and walls and water breaks that you put in on the trail crew years ago. 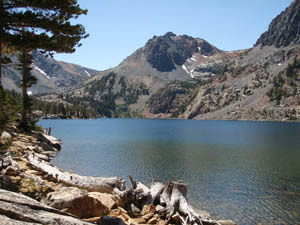 Climb to Summit Lake, a blue jewel hanging on the roof of the Sierras, and Summit Pass at 10,250'. Stop and sit a spell by Summit Lake, and listen: the silence of the mountains is different than the silence of the desert. Close your eyes, and you feel and hear their immense presence in the soundlessness. The mountains are... big. Significant. Permanent. In the mountains, you know how unimportant you are. The mountains will still be here after the trivial humans are gone and the Ravens have inherited the earth. Up here, it's just you and the wilderness: you and the forest, the mountains, the lakes, the chipmunks, deer, birds, marmots. The bears are here, somewhere. Taking a nap, maybe. Or grazing in a lower meadow. Maybe there's a cougar. I complained to my Ranger friend once, that in all my years here, I hadn't seen a cougar. "Oh," he said, "but they see you!" You (the lowlander) may be a bit tired after your hike up to 10,000'. But you can't stop now and turn around. If you go one step further west, you will step into Yosemite National Park. 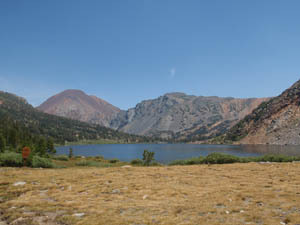 You can hike down into Yosemite, loop back into the Hoover to Green Lake on a different trail. A little extra mileage maybe, and another climb, but new trail you haven't seen before. You must go on. You step over Summit Pass into Virginia Canyon in Yosemite. "Pass" indicates 'uphill' in one direction, down in the other. It's a long steep descent. Nearly a thousand feet. 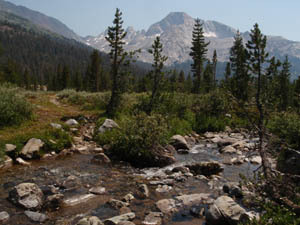 Down into Virginia Canyon and the headwaters of Return Creek. At the bottom the trail forks: left - deep into Yosemite, trails to follow for days, weeks. 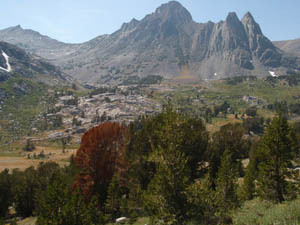 Right - Virginia Pass, and back into the Hoover. Another "Pass" means another 'uphill'. The sign says it's only 1.6 miles to the pass. It takes you well over an hour. 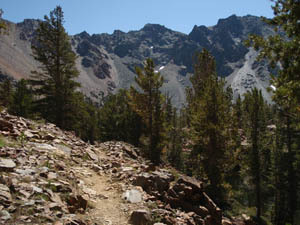 The first part is a moderate climb, following the tumbling creek. 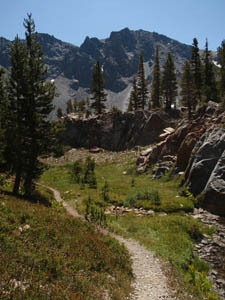 The trail opens up into a spectacular meadow, surrounded by a crown of mountains - a cathedral of peaks in the wilderness. Virginia Peak, at 12,001' is the crown jewel. You are the only one here to soak it all up. You were meant to be here today. You lose the trail in the meadow. You really don't care. You are in no hurry. You pull out your map, decipher by the topo lines where the trail is supposed to go, where the pass should be, in which saddle - otherwise, Virginia Peak will draw you in the wrong direction like a magnet to its top. Too late in the day, too tired to do that. You may be too tired to even make it up to Virginia Pass. You have to bushwack straight up the mountain, blaze your own trail, and it's quite steep. One foot in front of the other, a few steps and rest, as you regain back the thousand feet you gave up to experience the wilderness kingdom. Turn to look over your shoulder as you climb, at the circle of peaks around you: Soldier, Stanton, Virginia, Twin Peaks; to the distant south the jagged ridge of Shepherd's Crest, still holding pockets of snow. 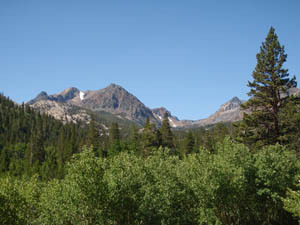 The pass you are aiming for is on the shoulder of Camiaca Peak, one you've climbed in years past. The high peaks seem more reasonable now, as you gain altitude. You are looking almost across at some of them, instead of up. Across the vast meadow now far below, Virginia Peak looks doable. But not today. It will still be there next time. It takes you a long time to gain the pass. You don't mind. You get your second wind at the top, as you step back into the Hoover Wilderness, and say goodbye to Yosemite, and your private, sacred cathedral meadow. Several times you lose the un-maintained trail in the descent through Glines Canyon back to Green Lake - but you don't care, because it's an easy climb/scramble down - down boulder fields, across little pocket meadows, through hidden little fields of flowers, past secret tarns, always with imposing peaks on both sides lining your insignificant passage. 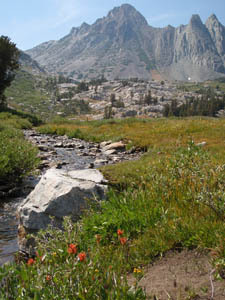 Little springs and snow run-offs become little creeks which join to form a roaring stream that - far below - dumps into Green Lake. After 12 or so miles, and two high passes, you (the out-of-shape low-lander) are pretty whooped now, but when you rejoin your loop trail below Green Lake, you have a skip in your step for the final 2 downhill miles. You just had a good long-awaited dose of the Hoover Wilderness and a glimpse of Yosemite; you discovered a new wilderness paradise that you had all to yourself for a brief time. Something to hang onto until the next time you return. Do you ever worry about wild animals such as bear when you are hikning alone? Merri, you don't even need to show your photos, as you paint a beautiful picture in words. I might be worried a little about brown bears (grizzlies), but there are only black bears here. 99% of the time they'll run away from you. the other 1% of the time, just use common sense - don't try to pet the cute babies, and don't smear yourself with honey.